Sivasagar District Administration is gearing up to celebrate the Desang-Brahmaputra Festival, 2015 on 2nd, 3rd and 4th January, 2015 at the venue of Dr. Bhupen Hazarika Samannay Kshetra, Desangmukh. The festival was launched in the year 2005 and continued intermittently upto 2012. After a gap of two years, the festival is proposed again and rechristened as Desang-Brahmaputra Festival. The proposed initiative aims to showcase the vibrant ethnic culture of Assam including its multihued dances, dresses, foot habits, etc. Desangmukh is amongst the repositories of the rich cultural tradition of Assam. This place is the confluence of different ethnicities. The riverine life and colourful festivities of Desangmukh attract people to this pristine land since time immemorial. In the tourism map of Assam, Desangmukh has its own identity. Every year, many tourists visit this place to immerse in its mesmerizing beauty. 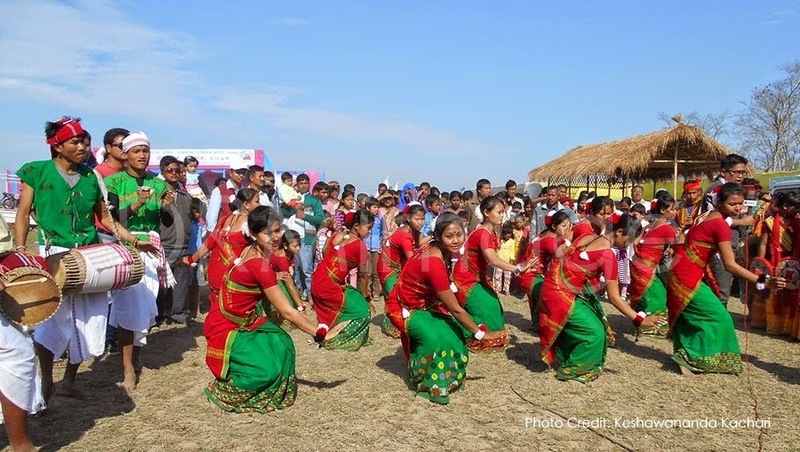 With a view to maximise the tourism potential of this place, Desang-Brahmaputra Festival was launched and it successfully mobilized tourist flow. 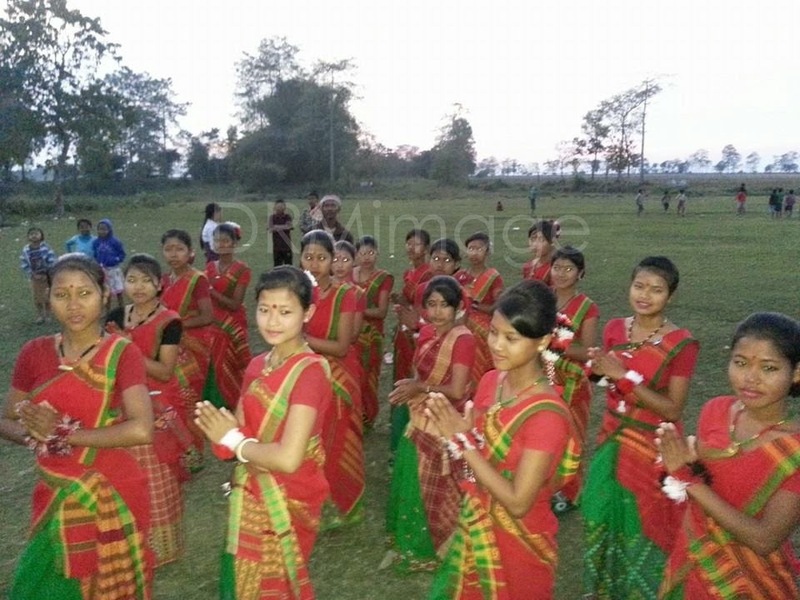 The District Administration proposes to carry forward the initiative with active support and cooperation of various organisations and the general public.Again on behalf the Desang-Brahmaputra Festival 2015, the following Celebration Committee also requests the public for all round cooperation in making the festival a grand success. 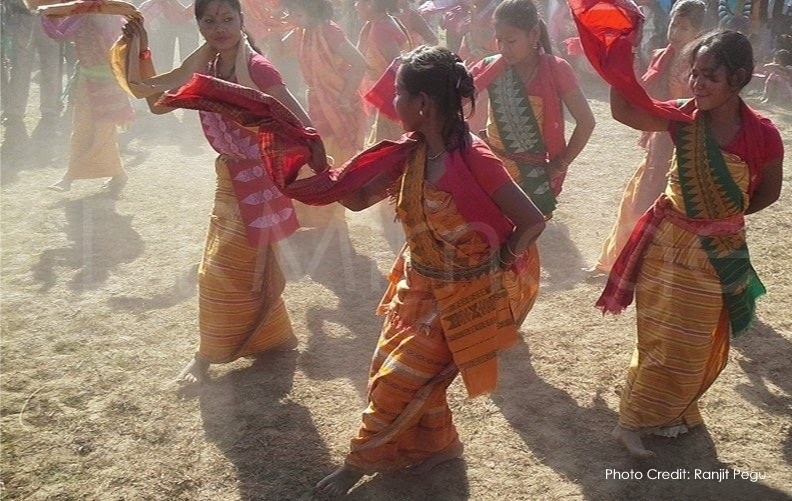 Bodo dance at Desang-Brahmaputra Fest 2015. PROGRAMME HIGHLIGHTS: This time the festival isall set preparedwith multiple activities, such as, creating entrepreneurial awareness through exhibition and sale of handicrafts products of village artisans, presentation of historical monuments, ethnic food festival including forest and agro products and cultural events representing artists from Dimapur and other parts of North-East Region. The National Half Marathon competition will be the attraction creating sports spirit among people for which the prizes will be given to the winners, such as, the first prize is a motor cycle, second prize – a laptop and third prize - a television set and seven other consolation prizes. While the ethnic fashion show will ornament the event, the interesting sports like river swimming and archery will add vigour. A five women musical troupe from Guwahati, namely, Pancha Rupa Group will give life in the cultural evening. Come, be a part of Desang-Brahmaputra Festival and have a thrilling experience. HOW TO REACH DESANGMUKH:Desangmukh is situated 12 KM north of Sivasagar Town. Road communication is the only way to reach Desangmukh from Sivasagar. ASTC Bus, Privately own Bus, Gramya taxi regularly ply from Sivasagar town. One can reach Desangmukh by ferry service from the North bank also. Hotels: Brahmaputra, Shiva Palace, Sidhartha, Brindaban, Piccolo, Talatal, Raj Palace, etc. 7:00 to 8:00 PM – Cultural Programme by local artists.